Seventy-two-year-old John Gascoigne has been a ReadyTechGo client for the past five years. This month he undertook his one-hundredth session to understand the new digital technologies. As a journalist, author, scriptwriter, cricket umpire and soon to-be-tech expert, there’s no challenge John won’t tackle. 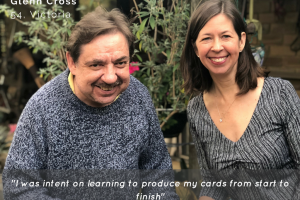 John’s quest began with a PC, using Microsoft then Apple, and led to three brands of mobile phone (he lost the first two mobiles) and an Apple iPad. John shared his career experiences With ReadyTechGo, describing the challenges of being a hyperactive-born journalist. He has reported and sub-edited in each of the mainstream media: newspapers, magazines, radio and television. Virtually eight separate disciplines under the banner of journalism. The digital devastation to “traditional media” has led to massive cuts to proprietors’ revenue and employment of journalists across the Western world, and John recognises his retirement probably came “just in time”. His farewell speech was not just to Fairfax but a 53-year career. For the past 14 years John worked as a journalist for Fairfax regional and suburban newspapers in Victoria. For 12 of those years he was a ‘check sub’, improving grammar, fixing errors, “streamlining clunky copy – anything the sub-editors may have missed”. He’s also written two books. Over and Out, published by Penguin, is a humorous account of 32 years’ umpiring cricket in the parks of Melbourne, while Nuggets: Golden and Human (Brolga Publishing) is a beefed-up version of 40 of the hundreds of articles he wrote while feature writer on the Bendigo Advertiser in the early 2000’s. He now enjoys apps, including Kindle, but, like most seniors, finds books in hard copy “hard to beat”. 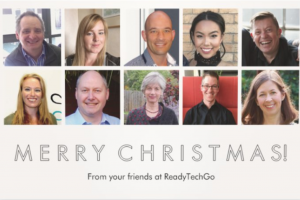 Asked about his experience with ReadyTechGo, John expresses his “love of the process of learning and working with Lisa (founder) and Matt (session facilitator)”. He says he enjoys both the friendly environment for learning – in his top-floor apartment next to the 1935-built art deco Astor Cinema in East St Kilda – and the interaction with his teachers. In Lisa’s eyes, John is a friend, not just a student. For five decades this New Zealander, who migrated to Australia in 1967, has been building his own story. Daily, he’s at his keyboard recording it for what he hopes will be his third book. Some freelance writing, he hopes, will further keep the rust at bay. Stay tuned!